Dear Brothers and Sisters, and beloved Young People! Entering this hall to talk about young people, we already feel the strength of their presence that emanates a positivity and enthusiasm capable of filling and gladdening not only this hall, but the whole Church and the whole world. That is why I cannot begin without saying thank you! I thank you who are present, I thank the many people, who throughout this two-year period of preparation have worked with dedication and passion – here in the Church of Rome and in all the Churches of the world – to enable us to reach this moment. I warmly thank Cardinal Lorenzo Baldisseri, General Secretary of the Synod, the Presidents Delegate, Cardinal Sérgio da Rocha, the General Relator, Monsignor Fabio Fabene, the Undersecretary, the Officials of the General Secretariat and Assistants; I thank all of you Synod Fathers, Auditors, experts and consultors; I thank the fraternal Delegates, translators, singers and journalists. I thank you wholeheartedly for your active and fruitful participation. A profound thank you is due to the two Special Secretaries, the Jesuit Father Giacomo Costa, and the Salesian Father Rossano Sala, who have worked generously with dedication and selflessness. They have worked themselves to the bone in preparation! I would also like to sincerely thank the young people connected to us now, and all the youth who in so many ways have made their voices heard. I thank them for having wagered that it is worth the effort to feel part of the Church or to enter into dialogue with her; worth the effort to have the Church as a mother, as a teacher, as a home, as a family, and, despite human weaknesses and difficulties, capable of radiating and conveying Christ’s timeless message; worth the effort to hold onto the boat of the Church which, despite the world’s cruel storms, continues to offer shelter and hospitality to everyone; worth the effort to listen to one another; worth the effort to swim against the tide and be bound by lofty values: family, fidelity, love, faith, sacrifice, service, eternal life. Our responsibility here at the Synod is not to undermine them; but rather to show that they are right to wager: it truly is worth the effort, it is not a waste of time! And I thank you in particular, dear young people present! The path of preparation for the Synod has taught us that the universe of the young is so varied that it cannot be fully represented, but you are certainly an important sign of it. Your participation fills us with joy and hope. The Synod we are living is a moment of sharing. I wish, therefore, at the beginning of the Synod Assembly, to invite everyone to speak with courage and frankness (parrhesia), namely to integrate freedom, truth and charity. Only dialogue can help us grow. An honest, transparent critique is constructive and helpful, and does not engage in useless chatter, rumours, conjectures or prejudices. And humility in listening must correspond to courage in speaking. I told the young people in the pre-Synod Meeting: “If you say something I do not like, I have to listen even more, because everyone has the right to be heard, just as everyone has the right to speak”. This open listening requires courage in speaking and in becoming the voice of many young people in the world who are not present. It is this listening that creates space for dialogue. The Synod must be an exercise in dialogue, above all among those of you participating. The first fruit of this dialogue is that everyone is open to newness, to change their opinions thanks to what they have heard from others. This is important for the Synod. 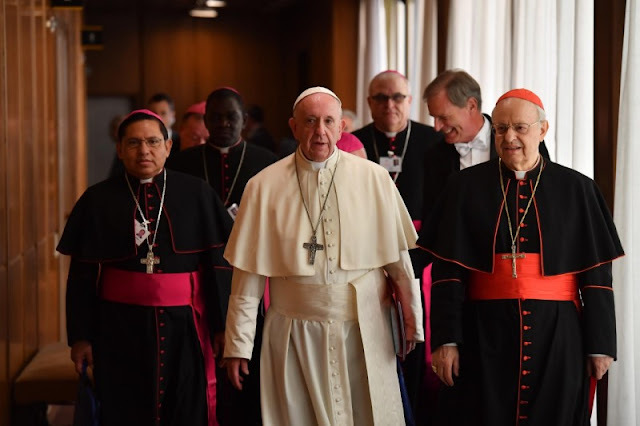 Many of you have already prepared your intervention beforehand – and I thank you for this work – but I invite you to feel free to consider what you have prepared as a provisional draft open to any additions and changes that the Synod journey may suggest to each of you. Let us feel free to welcome and understand others and therefore to change our convictions and positions: this is a sign of great human and spiritual maturity. The Synod is an ecclesial exercise in discernment. To speak frankly and listen openly are fundamental if the Synod is to be a process of discernment. Discernment is not an advertising slogan, it is not an organizational technique, or a fad of this pontificate, but an interior attitude rooted in an act of faith. Discernment is the method and at the same time the goal we set ourselves: it is based on the conviction that God is at work in world history, in life’s events, in the people I meet and who speak to me. For this reason, we are called to listen to what the Spirit suggests to us, with methods and in paths that are often unpredictable. Discernment needs space and time. And so, during the work done in plenary assembly and in groups, after five interventions are made, a moment of silence of approximately three minutes will be observed. This is to allow everyone to recognize within their hearts the nuances of what they have heard, and to allow everyone to reflect deeply and seize upon what is most striking. This attention to interiority is the key to accomplishing the work of recognizing, interpreting and choosing. We are a sign of a Church that listens and journeys. The attitude of listening cannot be limited to the words we will exchange during the work of the Synod. The path of preparation for this moment has highlighted a Church that needs to listen, including those young people who often do not feel understood by the Church in their originality and therefore not accepted for who they really are, and sometimes even rejected. This Synod has the opportunity, the task and the duty to be a sign of a Church that really listens, that allows herself to be questioned by the experiences of those she meets, and who does not always have a ready-made answer. A Church that does not listen shows herself closed to newness, closed to God’s surprises, and cannot be credible, especially for the young who will inevitably turn away rather than approach. Let us leave behind prejudice and stereotypes. A first step towards listening is to free our minds and our hearts from prejudice and stereotypes. When we think we already know who others are and what they want, we really struggle to listen to them seriously. Relations across generations are a terrain in which prejudice and stereotypes take root with proverbial ease, so much so that we are often oblivious to it. Young people are tempted to consider adults outdated; adults are tempted to regard young people as inexperienced, to know how they are and especially how they should be and behave. All of this can be an overwhelming obstacle to dialogue and to the encounter between generations. Most of those present do not belong to a younger generation, so it is clear that we must pay attention, above all, to the risk of talking about young people in categories and ways of thinking that are already outmoded. If we can avoid this risk, then we will help to bridge generations. Adults should overcome the temptation to underestimate the abilities of young people and not judge them negatively. I once read that the first mention of this fact dates back to 3000 BC and was discovered on a clay pot in ancient Babylon, where it is written that young people are immoral and incapable of saving their people’s culture. This is an old tradition of us old ones! Young people, on the other hand, should overcome the temptation to ignore adults and to consider the elderly “archaic, outdated and boring”, forgetting that it is foolish always to start from scratch as if life began only with each of them. Despite their physical frailty, the elderly are always the memory of mankind, the roots of our society, the “pulse” of our civilization. To spurn them, reject them, isolate or snub them is to yield to a worldly mentality that is devouring our homes from within. To neglect the rich experiences that each generation inherits and transmits to the next is an act of self-destruction. It is therefore necessary, on the one hand, to decisively overcome the scourge of clericalism. Listening and leaving aside stereotypes are powerful antidotes to the risk of clericalism, to which an assembly such as this is inevitably exposed, despite our intentions. Clericalism arises from an elitist and exclusivist vision of vocation, that interprets the ministry received as a power to be exercised rather than as a free and generous service to be given. This leads us to believe that we belong to a group that has all the answers and no longer needs to listen or learn anything, or that pretends to listen. Clericalism is a perversion and is the root of many evils in the Church: we must humbly ask forgiveness for this and above all create the conditions so that it is not repeated. We must, on the other hand, cure the virus of self-sufficiency and of hasty conclusions reached by many young people. An Egyptian proverb goes: “If there is no elderly person in your home, buy one, because you will need him”. To shun and reject everything handed down across the ages brings only a dangerous disorientation that sadly threatens our humanity, it brings a disillusionment which has invaded the hearts of whole generations. The accumulation of human experiences throughout history is the most precious and trustworthy treasure that one generation inherits from another. Without ever forgetting divine revelation, that enlightens and gives meaning to history and to our existence. Brothers and sisters, may the Synod awaken our hearts! The present moment, and this applies also to the Church, appears to be laden with struggles, problems, burdens. But our faith tells us that it is also the kairos in which the Lord comes to meet us in order to love us and call us to the fullness of life. The future is not a threat to be feared, but is the time the Lord promises us when we will be able to experience communion with him, with our brothers and sisters, and with the whole of creation. We need to rediscover the reasons for our hope and, above all, to pass them on to young people who are thirsting for hope. As the Second Vatican Council affirmed: “We can justly consider that the future of humanity lies in the hands of those who are strong enough to provide coming generations with reasons for living and hoping” (Pastoral Constitution Gaudium et Spes, 31). The meeting between generations can be extremely fruitful for giving rise to hope. The prophet Joel teaches us this – I reminded young people at the pre-Synod meeting – and I consider it the prophecy of our time: “Your old men shall dream dreams, and your young men shall see visions” (2:28) and they will prophesy. There is no need for sophisticated theological arguments to prove our duty to help the contemporary world to walk towards God’s kingdom, free of false hope and without seeing only ruin and woe. Indeed, when speaking about those who consider reality without sufficient objectivity or prudent judgment, Saint John XXIII said: “In the current conditions of human society they are not capable of seeing anything except ruin and woe; they go around saying that in our times, compared to the past, everything is worse; and they even go as far as to behave as if they had nothing to learn from history, which is our teacher” (Address on the solemn opening of the Second Vatican Council, 11 October 1962). Do not let yourselves be tempted, therefore, by the “prophets of doom”, do not spend your energy on “keeping score of failures and holding on to reproaches”, keep your gaze fixed on the good that “often makes no sound; it is neither a topic for blogs, nor front page news”, and do not be afraid “before the wounds of Christ’s flesh, always inflicted by sin and often by the children of the Church” (cf. Address to Bishops participating in the course promoted by the Congregation for Bishops and the Congregation for Oriental Churches, 13 September 2018). Let us therefore work to “spend time with the future”, to take from this Synod not merely a document – that generally is only read by a few and criticized by many – but above all concrete pastoral proposals capable of fulfilling the Synod’s purpose. In other words, to plant dreams, draw forth prophecies and visions, allow hope to flourish, inspire trust, bind up wounds, weave together relationships, awaken a dawn of hope, learn from one another, and create a bright resourcefulness that will enlighten minds, warm hearts, give strength to our hands, and inspire in young people – all young people, with no one excluded – a vision of the future filled with the joy of the Gospel. Thank you.